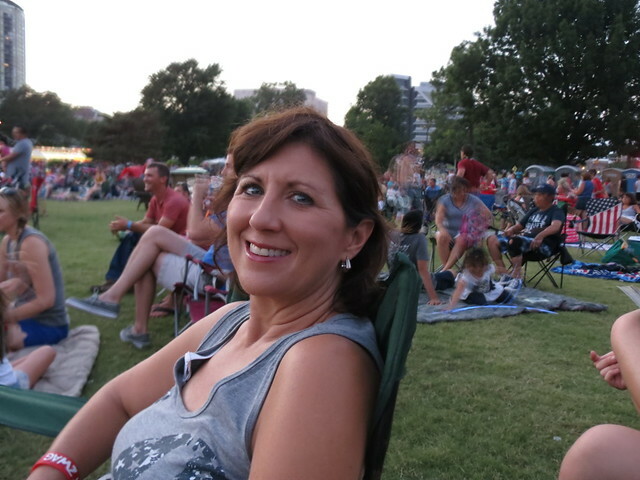 I started my fourth of July with a walk around Tulsa’s Lafortune Park. It is a little over 3 miles in length and is just the right size for a walk or run. 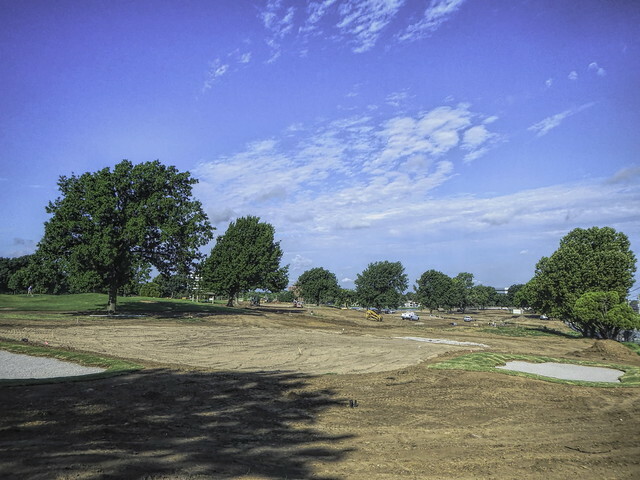 The trail goes around two golf courses including a par three circuit that is under renovation. Despite it being a holiday, the construction crews were busy working under the already hot sun despite being early in the day. 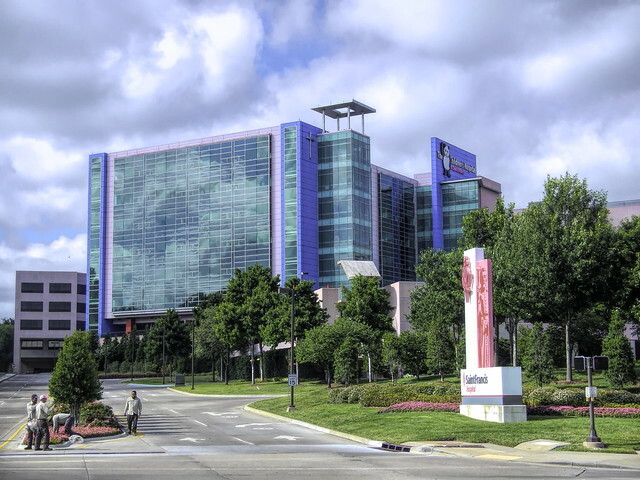 Later on, I passed Saint Francis Hospital. Their landscaping crews were also out working. So what is up? I am the only guy not working on the fourth? I finished my walk and Heather and I dropped Logan off at his job at the Neighborhood Walmart and then went to Nana’s house. 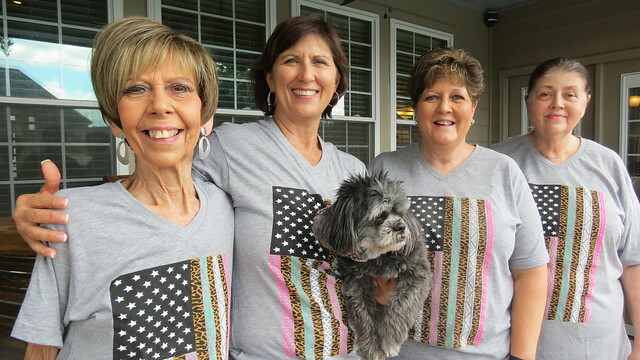 She and friends had been out shopping so all the women had matching July 4th tshirts. I didn’t have a tshirt, but I had a camera so I was assigned the task of documenting the occasion. 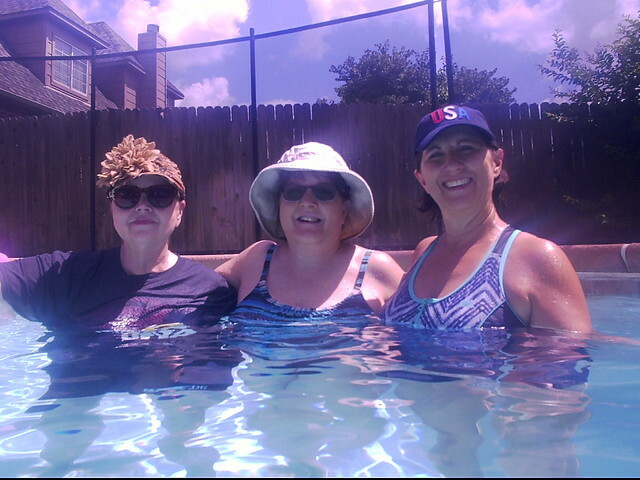 And then we moved to the pool. That felt good on such a hot day. 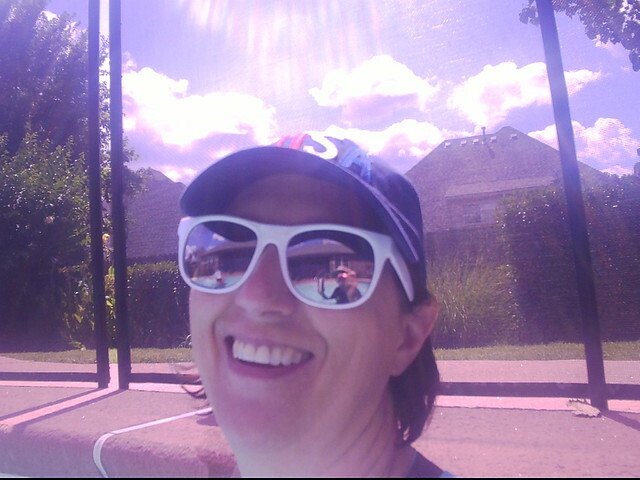 And my lovely wife, and me in the reflection of here glasses. 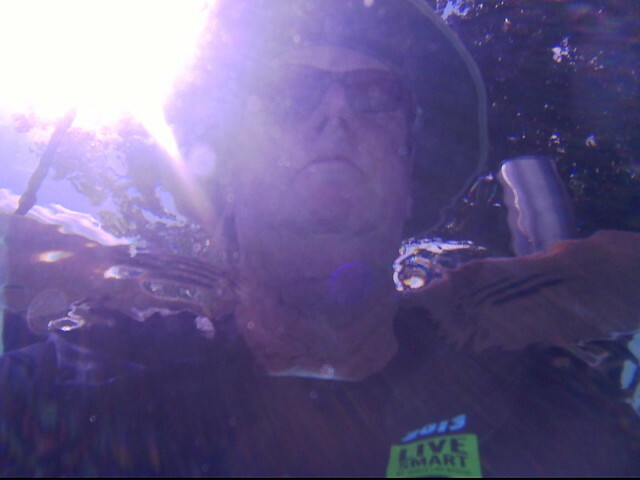 And a shot from underwater to me above the water. And then more people showed up and I was assigned grill duty. I love grilling with a full grill. We had hamburgers, hot dogs, and ears of corn, plus a lot of other food. 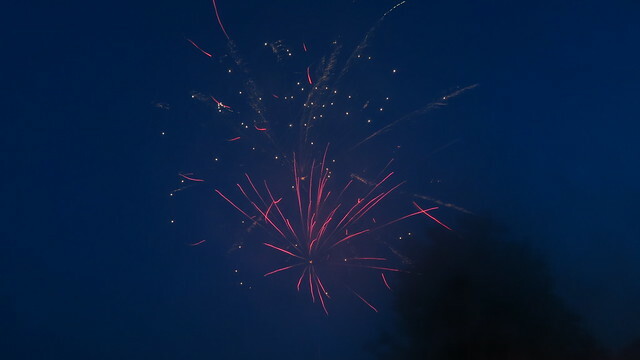 And then fireworks. I had VIP tickets to the big Tulsa fireworks show but we were all chilled out in at the house and didn’t feel the need to jump in the car and drive like mad. Some of the neighbors put on their own show. Not the big show close to downtown but nice enough. 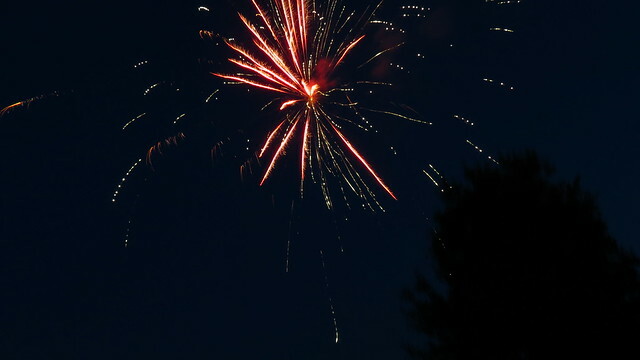 This entry was posted in Skywatch Friday and tagged Fireworks, Fourth of July, Independence Day, Oklahoma, Skywatch Friday, Tulsa on July 5, 2018 by Alan Bates. 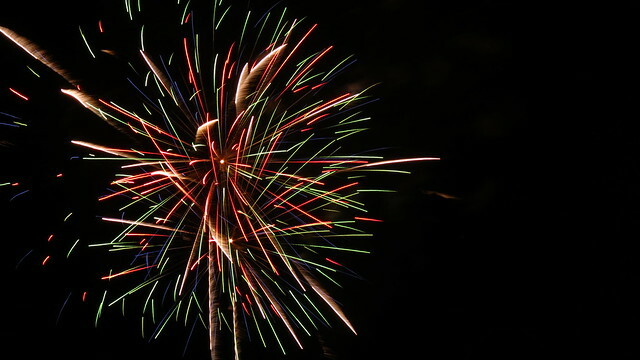 Skywatch Friday – July 4th Edition! 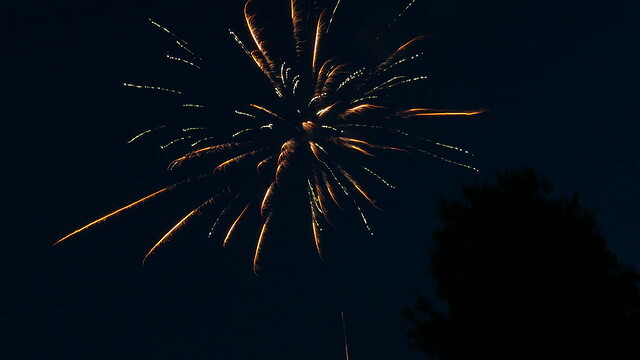 The 240th edition of the Fourth of July is over (241 actually because you have to count the original one right) and we celebrated in fine style in Tulsa by gum Oklahoma. 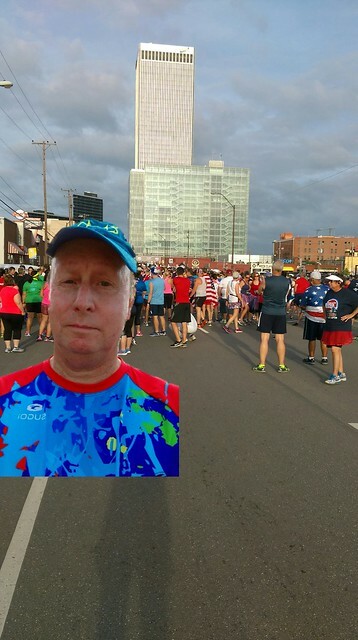 I got up early in the morning and went downtown and ran in the Firecracker 5K. The above is a feature of my phone called “Crop me in.” I love it even though it looks strange. Anyways, I ran it, hard, didn’t place but had a good time including three craft beers. I’m old, crafty, and sneaky so I know how to cut in the beer line without anybody noticing. I have to be that way because I run so blessed slow that I get to the beer line late. Just think of it as a way of handicapping. 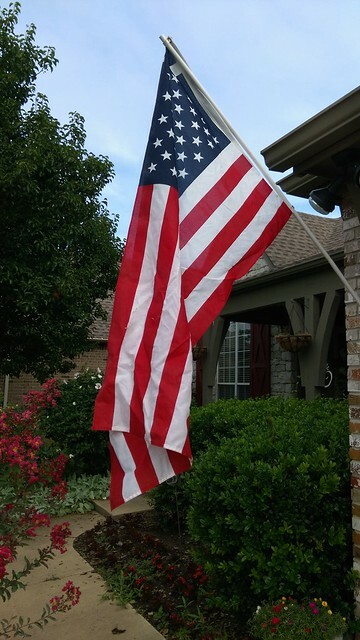 Tell you what, I don’t know how many houses are on our street, maybe forty or fifty over several blocks, but there were only three showing the flag. Less and less every year. Can’t get much less than three. Later that day, in the evening we made our way downtown to see fireworks. The city always does a good job with them. It always seems like a hassle but in the end it is worth it. So anyways, I’m an infrequent and irregular blogger these days. Busy, busy, busy, so I’m doing my Skywatch Friday post early this week. I hope that is okay with everybody. 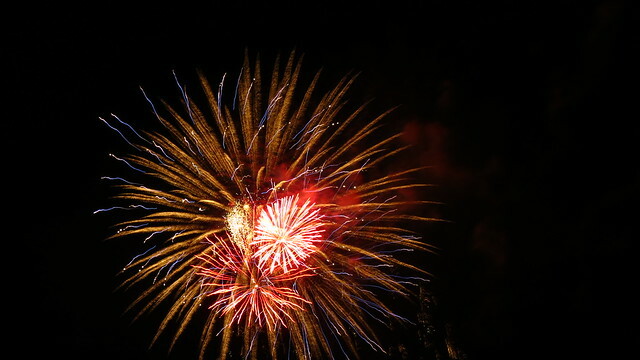 This entry was posted in Skywatch Friday and tagged Fireworks, Fourth of July, Independence Day (United States), July 4th, Racing, Running, Skywatch Friday on July 5, 2016 by Alan Bates.